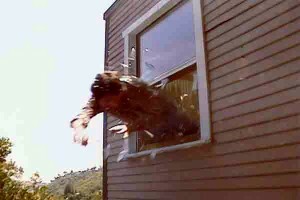 Midway through the humdrum interview Sola got up and took a flying leap out of his closed second story studio window in an explosion of glass. The stunned art critics dashed to the window, only to find Sola chortling on top of a pile of strategically arranged cardboard boxes eight feet below. Surrounding him were harmless shards of fake Hollywood style shattered glass. Needless to say, the studio visit was no longer humdrum! “People would scream with fear and pleasure at the same time,” Sola recalls. He repeated this act 22 times over several years. Artist’s message: Shattering the arrogance of the art world. Performance art, unlike performing arts, is not a play, symphony, or dance. It involves a group or individual artist becoming part of the art. Can you see the figure in this image? 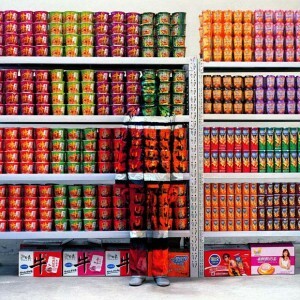 Chinese contemporary performance artist, Liu Bolin has the art world amazed with his “Invisible Man” series. Liu Bolin creates camouflage art work. He literally paints himself to disappear into signs, blend into sculptures and become an invisible part of his environment. Artist’s message: a political statement protesting the disappearance of poor Chinese from their homes and villages caused by China’s insatiable development. Watch this video on Liu Bolin…can you see him? Click here if you are unable to view the video. This is hilarious – thanks for sharing / writing about it! Wonderful and fascinating! Thanks for blogging about performance art. How do you feel about installation pieces — like the work of Sarah Sze? A different kind of amazing. Yes, Virginia, Sarah Sze’s installation at this year’s Venice Biannale was really terrific….using rocks, paper, construction material, etc, waiting to surprise the viewer! Sze created the piece in 3 month period. Thanks for bring our attention to Sarah Sze. This was just soooo fun! They are both people we’d all like to know. At least I would. I’ve seen some stuff called performance art. And, boy!, it wasn’t like this! It can be pretty boring. I suppose any art peice can be boring in the wrong hands. . . Thanks for the ray of sunshine! Now THAT is what is meant by “taking (performance) art” to a whole new level! How wonderful that you have made me aware of two “happenings” in the Art World! Thank you for this! Kirby – I appreciate and adore every one of your brilliant blogs. I never know what to expect – and I am never disappointed. I feel I am being well educated by one who knows and loves art – and is not afraid to to take us to the next level.